Before starting your engine, you should make a series of checks that will help you to set the best position for operating each of the controls for your safety and comfort. Doors - Make sure all the doors, the boot, and the bonnet are closed properly. Many cars will show a dashboard warning light if a door or boot is open so check your instrument panel once the engine is on. There is usually an internal courtesy light as well in most cars which helps you to remember but don't always depend on warning lights as a bulb may blow at any time and the doors may be left open slightly. Seat - Adjust the seat so that you can comfortably use the foot pedals, remembering to place the ball of your foot on the pedals. In a manual car while pressing the clutch pedal fully down with your left foot) ensure there is a slight bend in your leg at the knee. If you need to move your seat you can do so by locating a lever, found just under the seat in most cars. Move it forward or backwards to suit your position while holding the steering wheel firmly with your other hand. Steering wheel - To set the steering wheel, recline the seat back/forward so that you are not stretching or too close to the steering wheel. 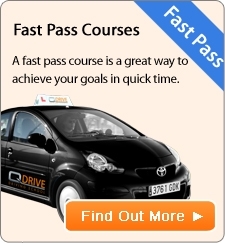 Place your wrists at the top of the steering and ensure it�s not too close or too far. While you drive hold the steering wheel at either the ten-to-two or quarter-to-three position for maximum control. Make sure the wheel or your hands don't obstruct your view of the instrument panel. Next you adjust the head restraint to reduce injury to the neck in the event of a collision. Adjust the head rest up or down so that the middle part of it is in line with your ears or eyes. Or if it seems easier the back of your head should be in the middle of the head rest. Seatbelt - Put your seatbelt on making sure the belt isn't twisted. The belt should be strapped firmly against your body. If your car has a seatbelt height adjuster, adjust it so that it is 2-3cms higher than your shoulder, so that the belt gives a firm pressure over the top of your right shoulder, with no gap between the belt and the front of your shoulder. Remember the law states that whilst driving a car you must wear your seatbelt at all times, except when performing a reversing manoeuvre or if you have a medical exemption certificate. It is also your responsibility to ensure that any passengers under the age of 14 wear seatbelts or the appropriate child restraint. Mirrors - Check your left, centre and right mirrors are correctly aligned, so that you can quickly see what's happening behind you with a glance, without having to move your head unnecessarily. Side mirrors - adjust them so you can see a small amount of side of the car is showing and that there is an equal proportion of road and sky visible. Interior centre mirror - adjust this so you can see the top edge of the rear window at the top edge of the mirror. Hold the mirror by the edges to avoid finger marks. Tip: On your driving test, when you first enter the car you are taking the practical driving test in, you must carry out the cockpit drill so that the test examiner can see that you are familiar with the routine. If however, you don't do the checks the examiner will know by assessing your body language if you have actually carried out the cockpit drill correctly.